Hendrik Johannes Cruijff, born in Amsterdam 1947, began his career at local club Ajax in 1964 where he quickly blossomed into a star. His excellent skills on the ball, great pace and ability to lift his team-mates to a higher level, made him an invaluable asset to the Ajax-team that would later conquer Europe. In his trademark jersey #14 Cruijff lifted Ajax to heights the club had never been at before. Six Dutch league championships, four domestic cup titles and then three straight European Cup triumphs 1971-73 plus a European Super Cup and World Club Cup title on top of that as well. 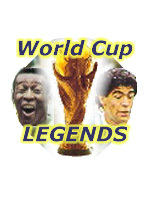 Johan Cruijff had taken over the torch from Pele as being the greatest player in the World. 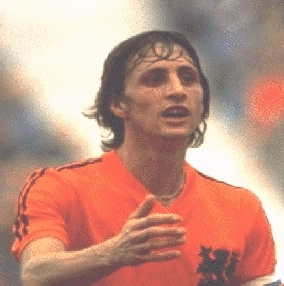 Cruijff left Ajax early in the 1973/74 season for Barcelona after 318 matches and 250 goals when his team-mates elected Piet Keizer as captain instead of himself. It disappointed Johan. "Barca" could offer a better salary as well and that of course helped luring him to the Catalan capital. Cruijff's immediate presence in the team helped Barcelona win a Spanish league championship that same season - their first in 14 years. In the summer of 1974, the Netherlands with Cruijff as the conductor and captain, impressed everybody in the World Cup in West Germany. Their "Total-Football" style where every player moved position all the time and somehow made the Dutch outnumber their opponents in every area of the field, gave great results as "Oranje" marched towards the Final in Munich in great style. Cruijff was instrumental in the latter stages when Argentina and Brazil were sent packing. The hosts were opponents in the Final and they hadn't even touched the ball when Cruijff was brought down in the penalty area in the first minute. The second Johan, Neeskens, put Holland in front from the spot. The Germans would however come back and win 2-1. The Dutch, though, won most of the hearts of fans world-wide and their performance in that World Cup made lasting impressions. Sadly, Johan Cruijff would never play in another World Cup again. He took part in the qualifiers for Argentina '78, but retired shortly before the finals without giving a particular reason. Everybody in the Netherlands tried to persuade him out of retirement, but to no avail. However, already in 1979 Cruijff was back out on the field again, this time in the North American Soccer League where many other fading stars had gathered. He turned out for LA Aztecs and Washington Diplomats over three seasons before returning to Europe, first a very short spell at Levante in Spain, then to his native Ajax in 1981. He won two more Dutch league championships there and another domestic cup title before ending his glorious career with rivals Feyenoord in 1984. There he won another league and cup double as a 37-year old with youngsters like Ruud Gullit as team-mates. Johan Cruijff then retired after 752 official career appearances and 425 goals. He was European Footballer of the Year (Golden Ball) winner three times and has since also been a highly successful coach at both Ajax and Barcelona.